If you don’t make Mexican friends as an expat, you will never really understand what a difference it makes in your quality of life. Having Mexican friends determines the framework of your entire social support structure. You can choose either to hang out with other frequently-bewildered expats, or enjoy a healthy mix of expats and people who always know precisely what’s going on - Mexicans. It’s up to you. It's up to you because you don’t have to be fluent to make Mexican friends, owing to the usual graciousness of the Mexican people. Even when I lock up on the language completely, the conversation finds a way to resolve itself. Anyone, regardless of age, can become fluent enough to be social and there is much you can do to further things along until you're at a more conversational level. You do have to be friendly and, after getting to know them a bit, reciprocate their acts kindness just like making friends anywhere. I am constantly on the look-out for those opportunities. My friends here have been extraordinarily good to me. If you think you have a budget problem, look at it this way, the money Mexicans can save you by telling you what you should pay for things and referring service providers who are personal friends of theirs will pay itself many times over for the investment of a few tickets or a dinner out. While those gestures, like an event or a meal are a great start, other gestures that cost nothing are equally appreciated. One terrific free way to contribute is help with their English practice. In Mexico, many people you meet will be trying to improve their English. The children of your Mexican friends are all studying English to enhance their future employment opportunities andincrease the likelihood of getting into certain schools. Offer to take some time to help them. Parents are interested in learning English because it’s an activity they can share with their children. Many older Mexicans find learning a second language empowering and intellectually stimulating just like many older Americans do. If they are taking formal English classes in Mexico, you will be amazed how terrible their resources usually are. One of the nice things you can do for anyone learning English is to have at your disposal a list of free online tools (especially phone apps) to help them. Some of these tools are language learning sites that I discovered in researching my book the “ Interactive Guide to Learning Spanish Free Online” that teach both English and Spanish. Others used by my Spanish exchange practice partners. Most of these tools come from Spain, a country that devotes great resources to promulgating and protecting the mother language, particularly Castillian Spanish. Share the list below with the friends you’ve made who are learning English, or keep it for when you do make friends who need them. Mansioningles.com - Recommended by one of my language exchange partners in Valencia, Spain, the tools is comprehensive enough that he says it's all he uses (and his English is quite good). Digital Dialects - great for beginners, the U.S. site uses games to teach basic vocabulary in 80 languages. Duolingo - Also for rank beginners, the most popular online tool for beginner Spanish students is also available for those learning English. The bite-sized lessons use lots of repetition. Gaming elements keep up the pressure to learn.You can compete with friends too making it a little like having a study partner. This one is good to gain enough basic vocabulary to form easy sentences and where many people start. Deep English - Another of my Spanish friend's favorite tools. If you're helping an adult learn English, it's surprisingly difficult to find stories at the right difficulty level, topic, and length that would interest them. This site curates interesting stories that make for great tools for reading out loud or discussion. Blabbinit English is a YouTube station that my Sevillian practice partner likes. LingQ - A bit more advanced, this is terrific free program with lessons from beginner to advanced, usually in the form of a story to read, with a vocabulary lookup feature. You simply highlight the word to get the meaning. Lyrics Training - teaches English through music and lyrics to popular songs. The song video is broken up with subtitles in English to follow along. Song artists include Adele, Green Day, Evanescence, Maroon Five, The Chainsmokers and Halsey. CISL - Is a language school in California with helpful blog and English lessons. Quizlet - One of my go-to’s when I have 15 minutes to kill for vocabulary, students post lists of vocabulary words or terms of the language they are learning. The program enables you to manipulate the list into flashcard games and other tests-made-fun. Studies have shown you learn three times more from tests than from studying. Students can create their own study sets of the words they find themselves using most. Blog para Aprender Inglés - also suggested by my language practice partner in Seville, Spain has lessons, idioms and videos. Readlang - Readlang’s best feature is its library. Students learning English can select stories in at their level. The program allows 10 free word-look ups per lesson. Edufone English Podcasts - Now only available on Itunes, these are wonderful little five minute audio lessons formatted with an English Speaker and a native Spanish speaker narrating a scene from everyday life. For example, “Maria gets Married.” A paragraph of the story is narrated in English, then repeated Spanish. Totally unique in its format, you begin to understand how to practice the language without word for word translation. The diction of the speakers is very helpful for pronunciation. BUSUU - For intermediates, BUSUU has both English and Spanish language lessons and online language exchange. This site will help English learners with their writing, as the site emphasizes language exchange. Students can find language partners, write in the second language, get corrected by native speakers and correct others’ writing for points. Also has mobile app. Ted Talks - My upper-intermediate Spanish exchange practice partners seem to really like Ted Talks to practice their listening skills and learn a little something. Medium.com - Medium of course is a site where anyone can post an article. What makes it great for Spanish students is that the articles will tell you upfront how long it is, and the shortest ones are very easy to understand for English learners. My Language Exchange, Conversation Exchange and Language for Exchange are all sites to facilitate finding native speakers to practice with. Generally you speak half the time in one language and half in the other, although I have one partner where I speak only Spanish and they speak only English. Once a person is at beginner intermediate level, exchange partners are an absolute non-negotiable for anyone really seeking to be conversant unless they have daily access to native speakers. Memrise - The Memrise community of students submits language lesson plans to share. Most of the lesson plans concentrate of vocabulary. Phone app available too. It’s a more visual site for the YouTube crowd. Linguee - Is a phrase look-up tool that comes in very handy for speaking and writing and comes in all romance languages. Fast Brain tv- Any English student will tell you what a nightmare phrasal verbs are for them. They give my exchange partners fits (I tell them it’s English’s revenge for the subjunctive mood in Spanish). I hung out with him. He brought up the subject. I worked through the problem. It went off the charts. English uses literally hundreds of phrasal verbs. It sometimes seems like half the English language consists of them and it drives English learners crazy, mainly when they are told they just have to memorize them, hundreds of them. Impossible. Hector Codonero has a multi-video series on his easier system on YouTube called FastBrainTV. He gives all his lessons in rapid-fire native Spanish. He is a knit-capped and guay Columbian and very fun to watch. With just a little imagination and resourcefulness you can make friends of all ages in Mexico as an expat. Keep this list of resources and possibly make a new Mexican friend. Related Links: Sometimes it only takes a joke or a toast in Spanish to keep things moving. The secret to making friends in Mexico? Start with one. Next up: Maybe healthcare in the U.S. is a little better, but Mexican healthcare is a lot kinder, as I learned personally. 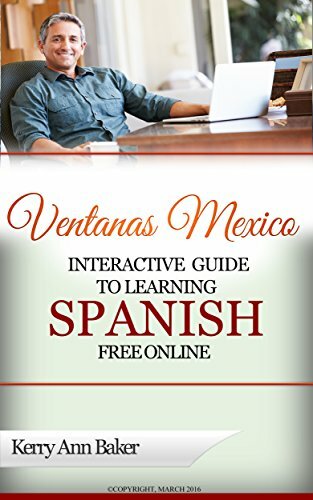 I’m Kerry Baker and am a partner with Ventanas Mexico and author of the "Interactive Guide to Learning Spanish Free Online." Go to any expat forum and you will see people advising you to get started on your Spanish before moving to Mexico. Use this tool to learn pain-free with unique lesson plans every day. 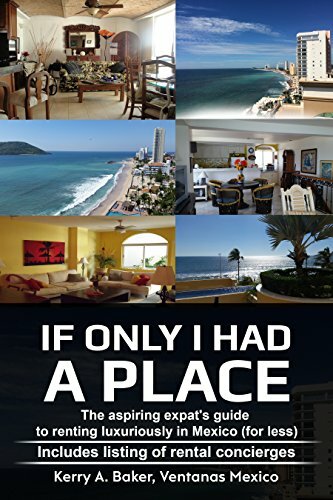 : "If Only I Had a Place" with my system of systematically renting well as an aspiring expat. Includes a listing of rental concierges to preview places before you sign the dotted line.